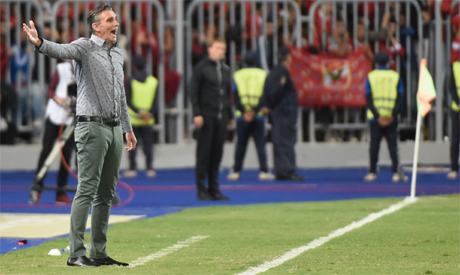 Ahly coach Patrice Carteron says his team will fight in the return match against Esperance in Tunisia to clinch the African Champions League title, while asking for special protection after being hit by one of Esperance’s players following the first leg victory. The record eight-time winners defeated their Tunisian hosts 3-1 at Alexandria's Borg El-Arab Stadium on Friday. "We delivered a good match and managed to get this comfortable win," Carteron said in the press conference after the match. The Reds are now favourites to win a ninth crown following the comfortable first-leg advantage. The second leg takes place in Rades next Friday. "We will fight in the second leg in Tunisia to return with the title. We will be facing a respectable team and we will have the proper preparation," the Ahly coach explained. "We had many chances in the first leg, but we should be stronger in the return match. Our players are experienced enough to deal with the awaited atmosphere in Tunisia," he added. Carteron also said some sad incidents spoiled the joy of the victory after the match, as he was hit by the foot of one of Esperance players, while the Tunisian fans insulted Ahly players. "We will ask for special protection for our team in Tunisia. I hope the Tunisian government will take effort to make the confrontation a football match, not a war in the stands," the coach said. "We will have much concentration in the coming days. I told the players that the final is from two legs. I have confidence in my players and also in their determination to return with the title," the Ahly coach concluded.